Bethlehem University conferred degrees on 712 graduates on 25 and 26 June at the University’s 42nd annual graduation ceremony. Dr. Said Ayyad, Chairman of the Arabic Department, served as Master of Ceremonies and opened the commencement ceremony with Palestine’s national anthem. Dr. Ayyad welcomed the attendees and wished the graduates a bright future. Following the University Anthem, Brother Peter Bray, FSC, EdD, Vice Chancellor of Bethlehem University, congratulated the graduates and their families. In his speech, Brother Peter stated that students at Bethlehem University have been “empowered to grow in their understanding and practice of leadership”. Brother Peter addressed the graduates telling them that this is a new beginning on their journey and that they are able to set a purpose in their life that will take them to further horizons. Mrs. Claudette Habesch, Chairperson of the Board of Trustees, congratulated the graduates and said that the university’s mission is to prepare generations able to combine science with culture and have professional ethics and respect for pluralism. Mrs. Habesch emphasized the role of the graduates in building the future Palestinian State and in protecting the national identity through their integration in the society. Bethlehem University was honored to host H.E. Councillor Eva Bolander, the Right Honourable Lord Provost of Glasgow, as the guest speaker. Councillor Bolander came to celebrate the first cohort of graduates in the Oncology and Palliative Care Program which was supported by Glasgow City Council, Glasgow and Clyde Health Board and Medical Aid to Palestine. Mr. Hanna Hanania, Deputy Mayor of Bethlehem, was the second day’s guest speaker. Hanania recalled his memories being a graduate of Bethlehem University which contributed in refining his personality and identity. Lara Kasbari, class of 2018 valedictorian, and Claudette Mubarak, first class honors student, gave the graduate speeches on Monday and Tuesday respectively. Both graduates were eloquent in their speeches which expressed their hopes for the future after their successful time spent at Bethlehem University. 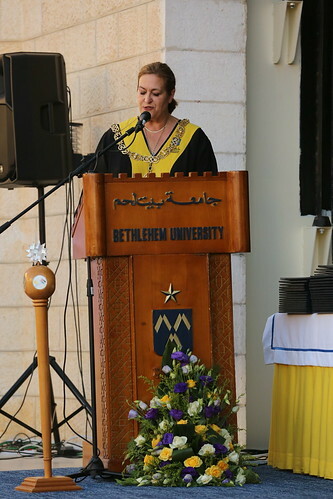 They also expressed pride in their achievements and the achievements of their classmates, in addition to thanking the Faculty and Staff of Bethlehem University for their dedication, patience, and inspiration. H. E. Archbishop Leopoldo Girelli, Chancellor and Br. Peter Bray, Vice Chancellor, assisted by Dr. Irene Hazou, Vice President of Academic Affairs, conferred the degrees and diplomas to the graduates. With the graduation of the 712 students, the number of Bethlehem University graduates has mounted to approximately 16,600 graduates since the first class of 1977. With each graduating class, the De La Salle Brothers, Regents, Board of Trustees, administration and faculty of Bethlehem University reaffirm their commitment to serving the Palestinian people by providing high-quality education designed to meet the needs of the Palestinian society.